Magnetic separation is a continuous process by which magnetic material is separated from non-magnetic material. The mixture of magnetic and non-magnetic material is passed through a strong magnetic field. Magnetic material is magnetized and gets attracted to the surface of the separator and is discharged in a chute. The efficiency of the separator depends upon the strength of the magnet and the speed of the conveyor. 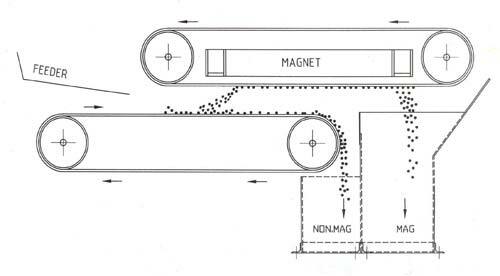 The length of the magnet is designed such that the magnetic material is in the magnetic field for a period of 0.4 to 0.5 secs. Strontium Ferrite permanent blocks are used in the magnet assembly to achieve a surface gauss of 2500. The gap between the magnet and the conveyor is adjustable. Lower the gap, better the separation efficiency. Individual drive is used for the separator and the conveyor. Adjustable stainless steel splitters are provided between the two chutes. Vibrating feeder with two unbalance motor is also provided, which ensures that the material spreads across the belt to achieve better separation. We can supply belt type separators for a belt width of 650 mm to 2000 mm. The mixture of char and sponge is passed under the Magnetic Separator by a conveyor. The mixture is fed on to the conveyor evenly by the help of a feeder. Under the influence of the magnetic field the magnetic material is attracted upwards, towards the magnet face. The attracted material is carried along the cleated belt of the Separator and is continuously discharged in the mag chute. The char is carried by the bottom conveyor and discharged in the non mag chute. Individual shaft mounted geared motor for top and bottom conveyor. Vibrating Feeder with two unbalance motors. Dust covers with inspection windows.